"i carry your heart with me" by e e cummings is the Songs of Eretz Poem of the Day for May 8, 2014. A link to the poem may be found here: http://famouspoetsandpoems.com/poets/e__e__cummings/poems/14130#. 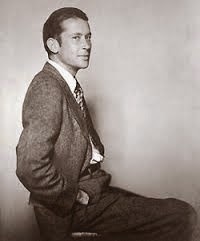 Edward Estlin Cummings (1894 - 1962) (pictured) has been described as "among the most innovative of twentieth century poets," and as a poet who, more than anyone else, "made avant-garde, experimental poems so attractive to the general…reader." He was not afraid to compose lyrical poetry on the, by his time, tired subjects of love and flowers. His eccentric twisting of words, grammar, and syntax is legendary. "i carry your heart with me" is nearly a sonnet, comprised of fifteen lines. The poem is divided into three stanzas, the first of which contains nine lines, which, but for the short fifth line, would have contained eight or have been divided into two quatrains. The second stanza is comprised of five lines followed by the final stanza, a lone singlet. Since the sonnet form is often associated with lyrical love poetry, I believe that this nod to it is no coincidence. The poem also has an interesting rhyme scheme, again reminiscent of but not exactly the same as that of a traditional sonnet. The last two lines rhyme and, though divided from each other by a stanza break, evoke the final heroic couplet of the Shakespearean sonnet form. The lack of any capital letters--signature Cummings--is a little jarring and forces the reader to look deeper, perhaps. The use of parenthetical phrases that flow immediately from the words before them and flow into the words after them further jars, but creates a sense of urgency, immediacy, intimacy, and perhaps a bit of anxiety--all found among the swirling emotions of one who is in love. The comparisons of the speaker's (the poet's) lover to the moon, the sun, and the sky--tired metaphors by Cummings' day--are freshened up and made to feel new by Cummings' unique presentation, while still retaining all the power that the old clichés once held. Reference to the general analysis made here as well as extensive additional biographical information about this famous and important poet may be found here: http://www.poetryfoundation.org/bio/e-e-cummings.